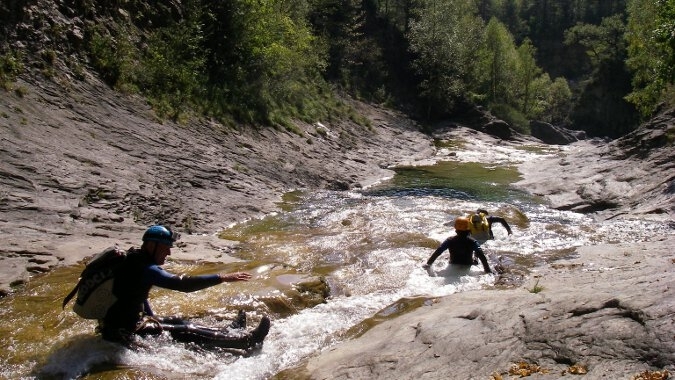 The Sierra de Guara, on the Spanish side of the Pyrenees, is a world class canyoning destination, and is an ideal base for a long weekend’s canyoning in the Spring, when the river levels and water temperatures are more comfortable than on the French side of the border. 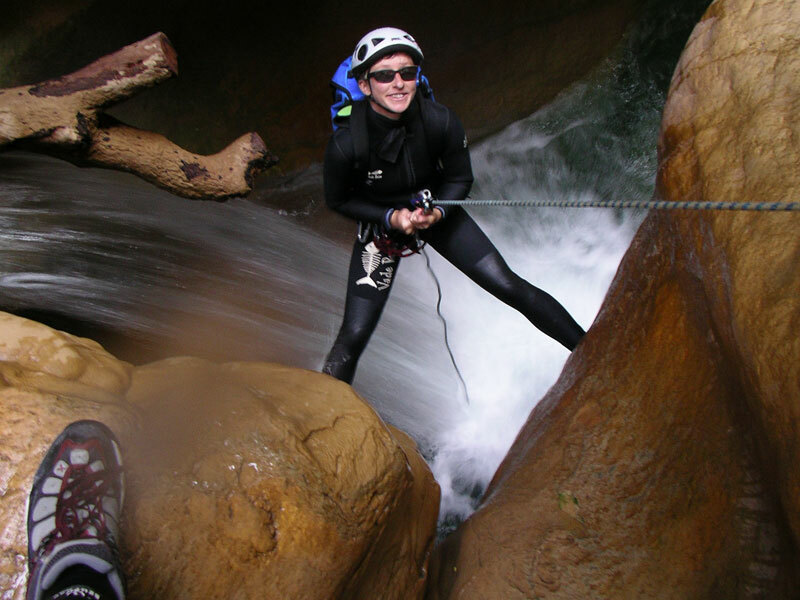 In the Sierra de Guara canyons you can find yourself between vertical canyon walls moulded with bizarre and beautiful rock formations, as vultures circle high overhead. 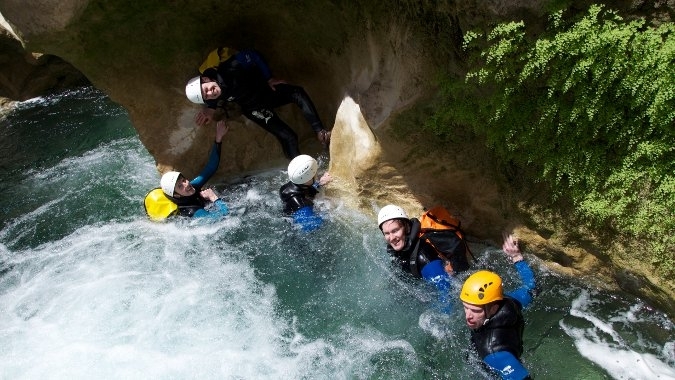 Escape the Spanish sun by abseiling through waterfalls, diving into clear blue pools, then meandering through underwater tunnels before floating lazily down-stream in the sun. During this holiday, we’ll meet you in France on the first day, so you may wish to arrange accommodation for the night before. Our accommodation is in a very comfortable 2* Spanish hotel. The hotel restaurant serves simple, but really tasty, local Spanish dishes, and is centrally located for exploring the Sierra de Guara. 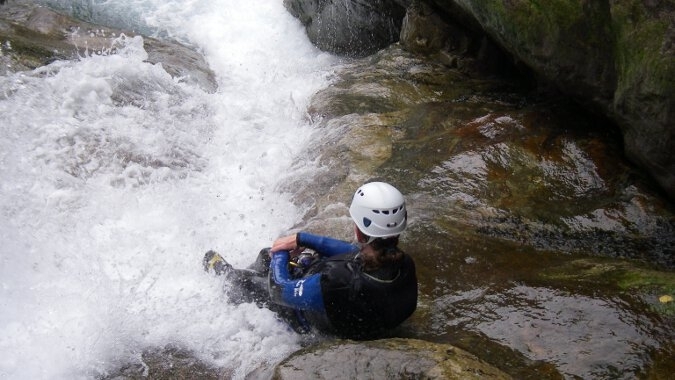 Itinerary permitting, we can also arrange an evening trip to the historic town of Alquezar for a stroll, a look at the castle, and (most importantly) some post-canyoning drinks and tapas. 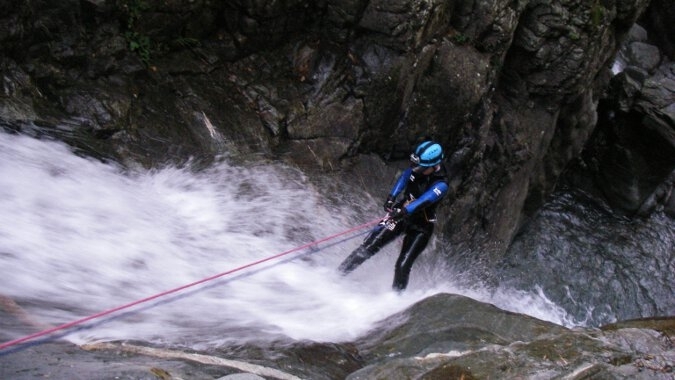 Our long weekend canyoning holidays are based on a morning departure from France on Day 1 and include two and a half days of guiding with a qualified local guide, all specialist equipment hire, 3 nights comfortable hotel accommodation and all meals (continental breakfasts, picnic lunches and 3 course evening meals). Depending on flight times, you may need to consider additional accommodation in France at either end of the trip. We leave from France in the morning. 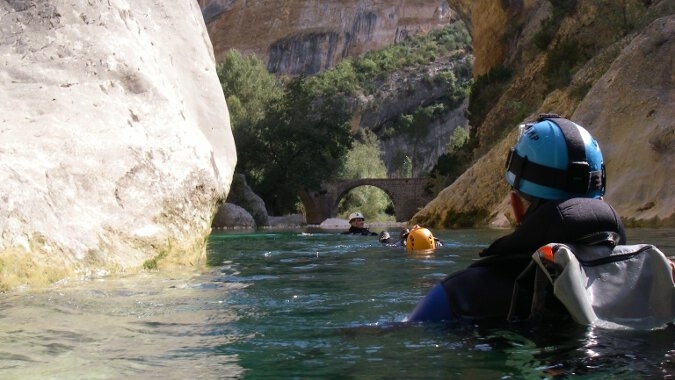 On our way to the Sierra de Guara, we stop off for an afternoon in the Canyon Formiga, a stunning aquatic canyon and a great introductory trip. 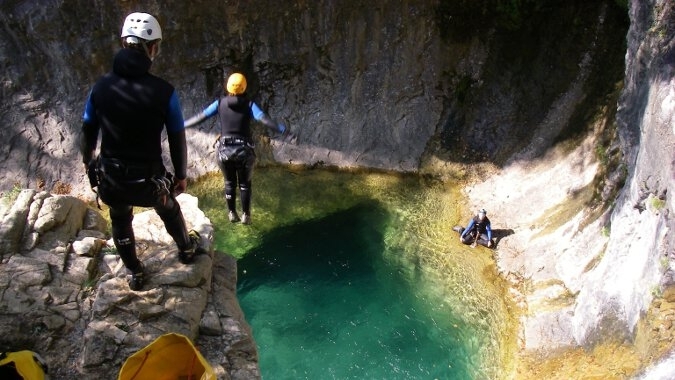 The canyon has beautiful green pools and colourful polished conglomerate walls – nothing too technical, but a good place to practice jumps and dives. 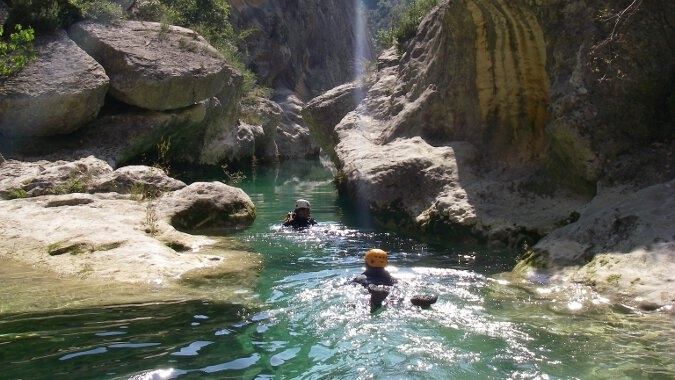 The Sierra de Guara has many famous canyons and we’re going to spend the day exploring this absolute classic – the Oscuros del Balces. 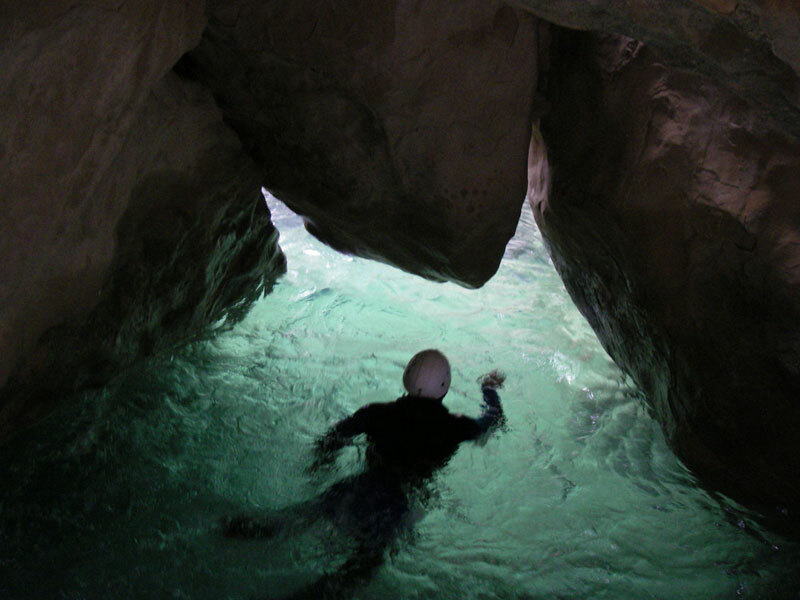 The Oscuros del Balces is another aquatic canyon with an amazing calcified boulder chaos and flooded turquoise galleries. 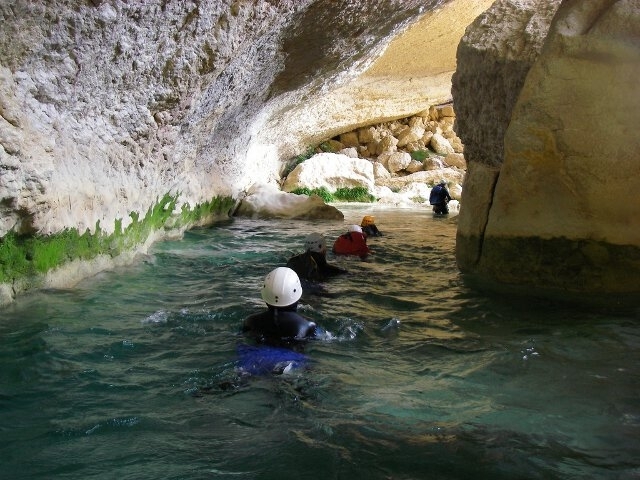 Floating through the narrow passages, you almost feel like you’re cave-diving in the blue lagoon. Bring your cameras! 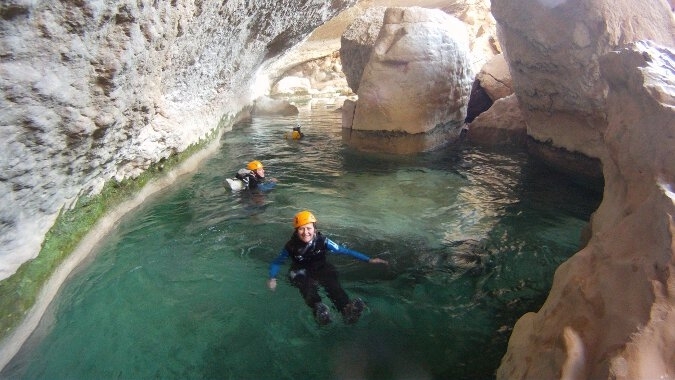 Today we head to the Rio Vero river gorge to explore the Rio Vero canyon, before ending in the historic village of Alquezar. We begin with a walk through typical Aragonais countryside before descending an airy dry-canyon into the Rio Vero river gorge. 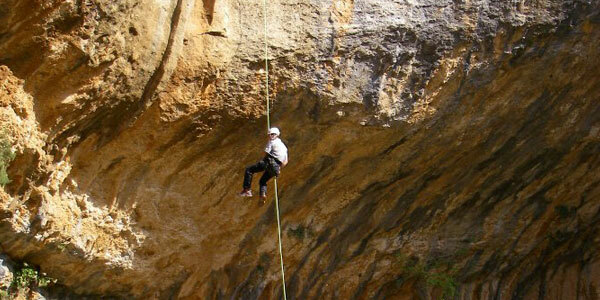 A spectacular 50m abseil is the highlight of the morning, followed by a picnic lunch beside the river. 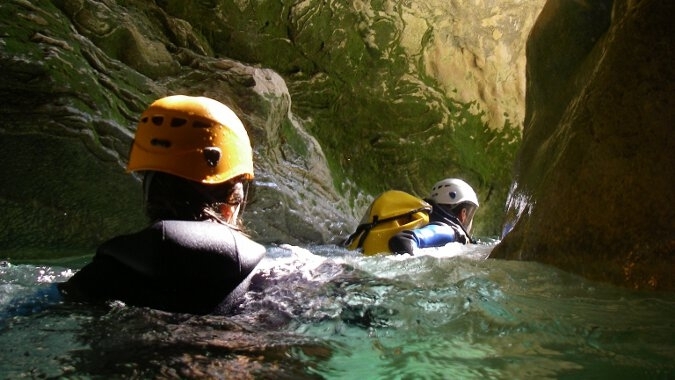 In the afternoon we float downstream – exploring scoured river channels, maze-like boulder chokes, and blue pools beneath the towering cliffs. The trip ends in the historical fortified village of Alquezar, with its rambling cobbled streets and sleepy tapas bars. Afterwards, we drive back to France for our final night’s accommodation and a celebratory meal.